Something a little different for the blog. 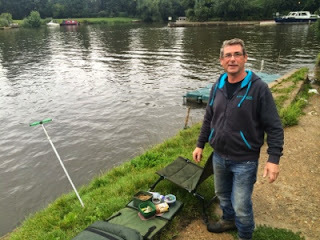 My good mate Dave Speller, most of you will know him as Shedders or those that attend the Withy weekend; Spiderman, enjoys a bit of river fishing for Barbel and whatever else comes along. He can be often found with the other gentleman, Jaap Stam "of West Ham", either on the river or playing darts! So, as I wasn't travelling with work this week I thought I'd sent Shedders a text to see if he would kindly take me Barbel fishing one night this week. My chance came earlier than expected and we set a date, time and place. I met Shedders down on the River Thames near Shepperton Lock. Now, it has been over 20 years since I fished a river and I've never caught a river Barbel before, so I was looking forward to the evening's events. What a great night, the BBQ was going, there was CO2 "nuggets" cooling peoples beer and often freezing it, gazeboo gate 1 where the gazebos blew over and new ones put up in there place. Football won by MFS, luckily no injuries, plenty of beer, wine and spirits flowing. Shedders bringing midnight snacks. Professor Colbrad picking up and sleeping in the wrong sleeping bag, coupled together with plenty of laughing and DJ Dum Dum, music for young people. You can imagine there were a few sore heads in the morning! Day 2 was upon us. Today I'd be fishing Yasi's and with a great result yesterday I was hoping to back it up. Peg 10 on Yasi's came out of the drawbag for me, another great peg with the aerator. Alan, my fishing partner for the weekend gave me some good advice on how to fish the peg. 3 foot depth, fish on the slope for the barbel towards the aerator, don't both about going over to the far bank. Another event that is a regular date in the diary, the How End vs MFS two dayer. Last year was a blast, not only the fishing but the craic with the lads and the hospitality of Pebs, Tarnya and the family. Day 1 and I arrived a little late with plenty of the lads already in the car park unpacking their gear.